How do royalty choose their partners ? These days probably much like the rest of us but perhaps with greater focus on dynastic concerns and the need to produce ” an heir and a spare “. As a Sun and Moon Cancer this would have to be a significant part of Prince William’s thinking on the subject. He can rest assured though, if there was such a thing as a Royal Dynasty version of Ofsted, his choice of Princess Kate is well on the way to ticking both boxes. Not all of his predecessors would have achieved such a good report, however with fellow Cancerian Henry VIII performing so badly that he had to put most of his wives into ” special measures “. The cause of Henry’s dynastic problems were more to do with him than his wives as said Cancer Sun was opposed by Uranus in Capricorn in the 5th house of children, not a placing that you would instantly associate with a large family. Henry’s response to this was to naturally blame someone else and the path taken was along the lines of his other major solar aspect – a square to the Moon in Aries in the 8th house. More information about this fascinating character can be found in the following article Can a planet have an effect before its discovered. Royal consorts are an interesting group. Historically most of them have come from other royal or at least noble families and many have had their marriages arranged for them by their families for political or dynastic reasons. After reading an article commenting on the Sun and Saturn being in hard aspect in 4 cases of royal spouses – Astropost , I was interested in following this up with a larger research study. I certainly seems to be the case that there are serious responsibilities that go with this position, particularly post Princess Diana with the media hounding them everywhere they go. So I have looked into the sign and aspect positions of 420 royal consorts ( houses and rising signs are not included as the vast majority of them didn’t have birth times available ). In terms of signs its hard to know what to expect. A superficial understanding might suggest the royal sign Leo or the maternal dynastic sign Cancer. In fact both these signs score a healthy 41 out of 420, 117% of the expected figure but by far the strongest score for Sun signs is Virgo with 51 or 146 %. The p figure in statistics is the chance that such a distribution could occur by chance and for this Sun sign distribution it is a healthy 0.037, perhaps just getting towards the point where statisticians might be prepared to admit that there might be something in it. It has to be said that this sample goes back 500 years and most of the consorts are from the 17th and 18th centuries. This was probably a time when the role didn’t attract quite such a high media profile and perhaps the consorts chief expectation was to stand quietly behind the monarch, a role that Virgo is certainly used to following Leo around. The most popular place for the Moon is a tie between Cancer and Libra with 49 ( 140 % ). Both are placings that fit quite nicely with the expectations of the role. Perhaps the one sign placing that suggests a princess is Venus in Leo. This fits very well as its by far the most common Venus placing with 51 ( 145 % ). The one sign that definitely does not seem to fit is Pisces with both the Sun and Venus scoring a mere 20 ( 57 % ) and Mars only 16 ( 46 % ). In fact the Mars distribution is very interesting. The highest scoring is Virgo with 48 ( 137 % ), but the figures for Libra ( 47 ), Scorpio ( 45 ) and Sagittarius ( 43 ), give a strong Autumnal sign spread particularly when compared with the next group of 4, Capricorn ( 27 ), Aquarius ( 20 ), Pisces ( 16 ) and Aries ( 26 ). This Mars distribution gives a very strong p figure 0.000107, particularly as anything below 0.01 is considered to have statistical significance. From an astrological perspective this does seem to be significant, even though its difficult to know exactly of what. In terms of aspects we might expect Jupiter to be strong, particularly in terms of its connection to the Moon. This does seem to be the case particularly with the opposition which appears at 146 % of the expected number of times. Mercury conjunct Jupiter occurs very frequently at 166 % which is interesting particularly as the Sun / Jupiter conjunction has only an average score. But there is one aspect that really stands out – the Sun is conjunct Saturn a whopping 189 %, an extremely high score for a sample this size. Which all goes to show that the responsibilities and restraints of the role have always been a factor. So how does Kate fit with this research. Unfortunately no birth time is available. Capricorn Research feels that William has really let us down here, surely it can’t be beyond the heir to the throne to find a wife whose birth time is known. Unless its a deliberate tactic by the family. 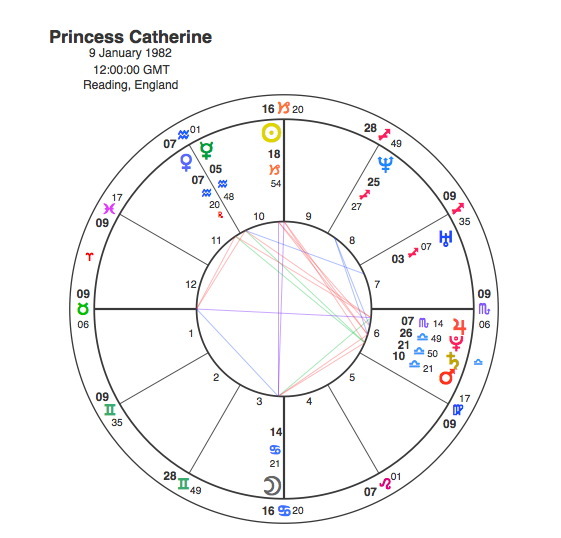 Maybe Kate’s time is being kept secret, after Diana’s birth chart was probably the most discussed in history. Kate has the Moon in Cancer and her Sun is aspected to Saturn so she has a number of the qualities that have featured so strongly throughout this group of royal consorts. However if there is one that fits the archetype perfectly its Queen Letizia of Spain. Letizia has the Sun in Virgo and Venus in Leo. She also has the Sun in aspect to Saturn. Her Sun / Mars conjunction occurs 134 % of the expected number of times in the full sample and her Moon is in aspect with Jupiter. 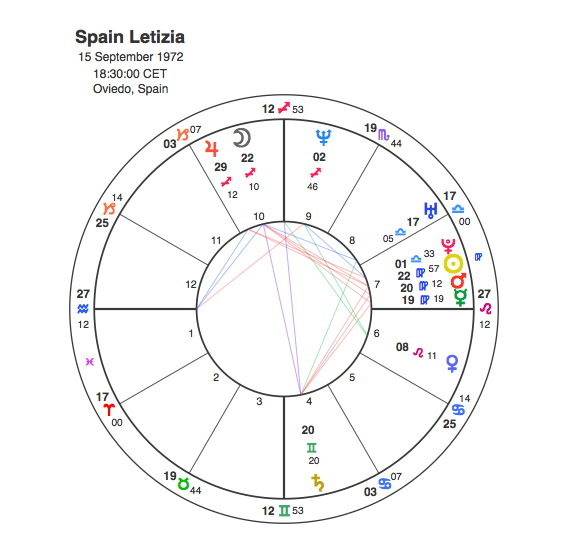 Both Kate and Letizia have T squares involving the Sun, Moon and Saturn but Letizia’s T Square has a stellium at the apex of it in the 7th house and the Moon conjunct Jupiter in the 10th. What more could you ask for in a royal bride ? She must have been picked astrologically. Thank you for a very interesting article. Is there an email on which I can contact you? Many thanks! Ze.